In DPP v Johnson  VSCA 288 the Director appealed a judge's sentence for offences of aggravated burglary, common law assault and contravention of an intervention order. The respondent, in breach of an Intervention Order, entered his former partner['s] house in the early hours of the morning of 14 November 2009 with two knives, with the stated intention of killing himself and having her witness it. He entered her bedroom where she was asleep with one of their daughters. [She] commenced to scream which awoke her daughter. Upon appreciating the terror the respondent had caused his daughter he desisted from his plan and after a short period of time left the premises. In the County Court he was given an effective sentence of one year and nine months, with 10 months before becoming eligible for parole. The Court of Appeal quashed that sentence and replaced it with three years and three months of imprisonment with a minimum term of two years and two months. The Court was particularly critical that the intervention order sentence of six months was made entirely concurrent. In my opinion the term of six months was manifestly inadequate and his Honour should not have made it wholly concurrent with the sentences imposed for aggravated burglary and assault. The sentencing judge wrongly took the view that the circumstances in which the respondent breached the intervention order were ‘almost identical’ to the aggravated burglary and the common law assault. As he recognised earlier in his reasons, the breach of the intervention order was not limited to the conduct covered by these other charges. On 10 November, four days before the respondent invaded the victim’s home, he breached the intervention order by telephoning and threatening her and her family. On the night that he committed the assault and aggravated burglary, he breached the order at the point that he came within 200 metres of her house. All Australian states have enacted legislation which is intended to protect potential victims of family violence from physical injury and from being placed in fear by harassment or threats. Family violence is a serious problem in Australia. In 2004, it was reported that family violence is ‘the leading contributor of death, disability and illness in women in Victoria aged 15 to 44 years’. Breach of intervention orders is relatively common. 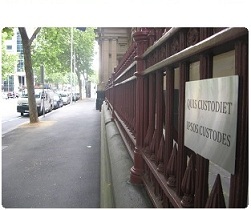 In its Report on Breaching Intervention Orders [Edit: sorry, this one], the Sentencing Advisory Council said that, between July 2004 and June 2007, the Magistrates’ Court of Victoria and the County Court of Victoria imposed on average approximately 14,000 intervention orders per year. Over a quarter of all intervention orders imposed were breached. A breach of an Intervention Order, especially in contexts where the breach is a prelude to violent indictable offences and may involve the offender’s former partner has not always been viewed as seriously as it should. Their gravity is well documented in empirical research and numerous decisions of this Court. The fact that it was imposed at the same time as the sentence for aggravated burglary would not have justified any reduction in the sentence for the breach of the Order, as the sentence fixed for each individual offence must be an adequate one as Postiglione v The Queen makes clear. The (now former) DPP was spectacularly unsuccessful in his attempts to get the Court of Appeal to depart from current sentencing practices concerning Recklessly Causing Serious Injury in DPP v Winch  VSCA 151 last year (discussed here). DPP v Johnson will probably act as a gentle nudge to the lower courts to sentence more harshly for serious intervention order contraventions. That 14,000 orders a year, one quarter breached statistic isn't good. My first response to your post was: "Three quarters of intervention orders AREN'T breached? That's terrific." But it's also almost certainly false. The figure Neave was referring to was about proved charges. She accurately quotes the SAC report (available at http://sentencingcouncil.vic.gov.au/sites/sentencingcouncil.vic.gov.au/files/breaching_intervention_orders_report.pdf. You link to the wrong one.) But the sentence she quotes (from a 'summary' at [3.6.1] is poorly written and doesn't specify that it's only talking about proven charges. What's worse is that the summary sentence identify what figures it was using and I suspect that the 'quarter' calculation is erroneous. It seems that the calculation involves dividing the number of sentenced IVO charges (at 3.3.1) by the number of IVOS (at 2.3.12 - Figure 1), yielding 27.5%. But this only gives the number of IVOs found to have been breached if you assume that each charge is for a different IVO. Unlikely, right? In fact, another section of the report (at 3.5.2) shows that there were only 5500 people sentenced for IVO breaches in that period. So, it looks like there was an average of two IVO breaches per person. Maybe some of those breached two separate IVOs (or more for some people), but I suspect that a lot of the charges were for multiple breaches of a single order. If all 5500 people were like that, then the number of IVOs proved to have been breached was more like 13%. So, if Im right, all we know is that between 13% and 27.5% of all IVOs were proven to be breached (from 2004-2007.) A pity the Sentencing Advisory Council communicated its analysis and its limits so poorly. More's the pity that it was used as part of an appeal judgment that led to someone's sentence being increased. Entered as trespasser with intent to commit suicide.